This auto start powerball without digital LCD counter, please kindly noticed. 1. Toggle the ball along the double direction arrow to the max resistance,then release it,fast enough to have the ball turn the LED on. 2. Turn your plam facing down, and slowly start to rotate, you will feel that it is scratching against the inside of the wrist ball. 3. Keep rotating with wrist then the ball will spin faster, develop a higher pitch sound. Once you feel it spinning fast enough, stop your rotate, you could feel it oscillating right in your palm. Auto start powerball with incredible high speed, up to 20,000 rotational speed per minute pass through testing, blue LED lights come out when you doing exercise. Human control the speed and power, 10,000 rotational speed per minute about 48.50lb power, correspond to 50 dumbbells of different weights. 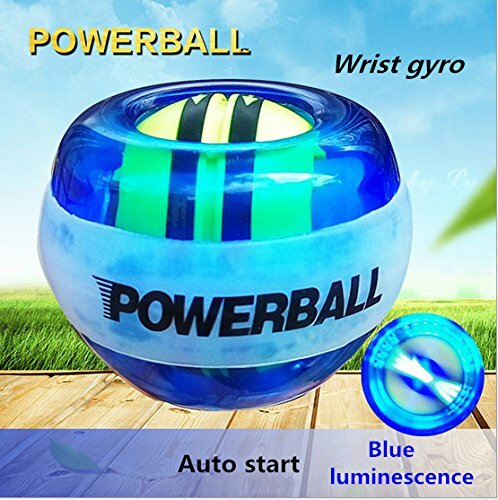 Pure mechanical wrist ball, no batteries or powersource, environmentally friendly without electromagnetic radiation, military-grade plastic shell to protect your spinner gyro ball toy. Portable size forceball, you can exercise your wrist, fingers, forearm and muscle indoor outdoor, in the office, you can body strength anywhere, good choice as a gift to your lovers. Children must be accompanied by an adult or parents to exercise together. Customer service please go to below seller warranty description. If you have any questions about this product by Nwell, contact us by completing and submitting the form below. If you are looking for a specif part number, please include it with your message.